Dave was educated at Lyndhurst, Charterhouse and Tonbridge, where he received his first formal music training. He later enlisted in the music services of the Royal Air Force where he developed his performance skills primarily on piano, studying privately with the renowned jazz pianist and composer Stan Tracey. Whilst at the Royal Air Force School of Music he also studied the clarinet, flute and soprano sax. After five years service he went on to study piano again with Stan Tracey. Dave is one of only a handful of established contemporary composers for film and television music who are capable of working in a entirely self-contained environment, embracing the very latest state of the art computer recording and synthesis technology in their own studio environment. Dave has an extensive sound design studio with the largest privately owned Synclavier systems and synthesizer setups in Europe. He is also adept and experienced in writing for and directing orchestras and live musicians, and is very successful in fusing this with his extensive library of original and treated synthesizer/sampler based sounds. 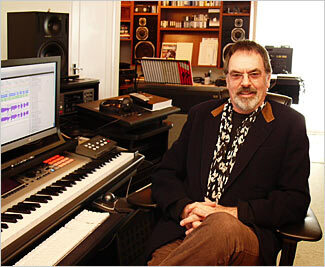 As a composer Dave has worked on a number of successful feature films and television programs, in addition to working as music associate, performer and programmer to many successful Hollywood film composers such as George Fenton, John Williams and Trevor Jones to mention but a few. In his capacity as music associate and programmer he takes a very active role in arranging and orchestrating and even using his compositional skills to a large degree. His ability to realize and create quality and often-unique sounds has also lead to quite extensive credits as a sound designer, both musically and with relation to film/television sound effects. Musically he has used this talent to great effect in so-called fusion scores such as the early Trevor Jones films such as Angel Heart and Mississippi Burning (which actually won an Oscar for best sound), where the created sounds were an integral part of the compositional process. The Steven Spielberg Amblimation production Were Back and Kenneth Brannaghs Mary Shelleys Frankenstein both won Golden Reel Awards from the Association of Motion Picture Sound Editors. Dave has also composed and co-composed, with Ronnie Bond and David Dundas, music for a large number of cinema and television advertisements including British Gas, Coco Pops, Philips, Le Coq, Birds Custard, Braun, Blueband, Brittania, Philip Morris, Accurist, Atari, Dixel, Dulux, Roxy, Mintguard, Bonjour, Ellermans, Wilkinson Sword, Foster Grants, Alpine, Washn Dye, Arctic Lite, Yves St. Laurent Kouros and others. In the 1970s Dave was a singer, keyboard player and songwriter for a number of successful groups, Web (later to become Samurai), Episode Six, The Alan Bown Set and Greenslade. He then went into the session musician scene breaking off briefly to tour with Roy Harper and later Stackridge. He was then invited to join Ian Gillans band, (who had recently left Deep Purple) but because of recording commitments regrettably had to decline the offer. He also recorded some tracks with Chris Squire and Alan White, who at the time were taking a break from Yes. Jimmy Page also jammed with this set up and had managerial matters been resolved this line up would have been one hell of a band! Tony Reeves, the bass player with Greenslade invited Dave to jam with Curved Air, who at the time also included Stuart Copeland. In 1982, whilst recording with Bill Wyman, Dave was invited to play with Foreigner. The session scene in the 70s and 80s was the busiest time ever for Dave. He played on the soundtrack of the cult picture The Man Who Fell To Earth with fellow musician Big Jim Sullivan, who he later recorded with and was then fortunate enough to play under the baton of John Williams and the L.S.O. on Starwars, Superman and The Fury. Other memorable sessions were with Peggy Lee, Bing Crosby and Fred Astaire.